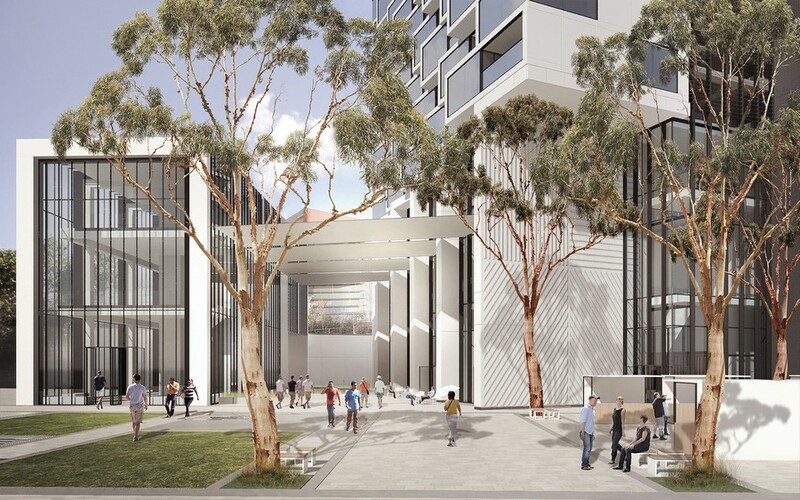 9th April 2013 – Grimshaw has submitted a Development Application on behalf of Parramatta City Council for a landmark mixed-use tower. The Aspire Tower emerged from a design excellence competition held by the Council and is set to establish a new benchmark for innovative, passive-environmental design in Australian high-rise developments. Designed to act as a catalyst project for Parramatta Square, the tower provides high density, urban residential living which is not only affordable but also sustainable. As one of the tallest structures in Australia, the engineering of Aspire Tower consciously orientates itself to the wind and to sunlight. The highly adaptable facades accommodate all of the various planning arrangements of apartment type into a modular system. The tower’s striking sculptural form twists upwards from its Church Street alignment to maximise the capture of the sun, the breeze and northern views for its residents. The accommodation within the tower is situated in two east and west facing wings which are connected to a perforated central core. These wings open up to the south to catch the prevailing air movements, while twisting inwards to the north to disperse the downward force of the wind. By resolving the effects of wind and ventilation, the tower creates a comfortable and accessible habitat at all levels, in both its private and public domains. The design has consciously set out to ensure that all apartments have an equity of view, ventilation and light. Sitting 90 storeys above ground, the tower’s spires reach 336m, while the 306m roof height of the habitable terraces creates a distinctive silhouette for the city’s emerging skyline. The mixed-use nature of the tower also creates a new precinct with 700 residential apartments. These ‘vertical neighbourhoods’ are configured around 14 six storey communal atria with soft and hard landscaping. The precinct also includes 150 hotel rooms, bars, restaurants and retail as well as a spectacular public function including a restaurant space, experience centre and viewing deck over the top two floors. The tower will also create a new public and civic realm for Parramatta. This new public realm, created from the re-development of Church Street and a new square on axis to St John’s Cathedral, forms the western precinct of Parramatta Square. A vibrant public domain will emerge from the activities on the square with the perimeter uses of retail, building lobbies and transport connections. Speaking about the achievements and ambitions of the project, Grimshaw Partner, Andrew Cortese, said: “Grimshaw’s approach is derived from the practice’s research on the habitat of tall buildings and on the design of the public and environmental infrastructure of cities. Aspire Tower on Parramatta Square is a rare opportunity to invest in and construct a viable and vital piece of city-making. “The project has the ability to transform its place and set a new achievable standard in affordable and sustainable urban development. We hope that the tower will be recognised as a landmark through its balanced achievement of programmatic and environmental innovations, its rationality and buildability, and its unique sculptural form”.